Turn your 2014 Super Bowl super celebration into a seafood feast. Yes, we are talking about lobster; lots of fresh, great tasting Maine lobster for a Super Bowl lobster dinner. And lobster is easy to prepare with this simple boiled lobster recipe. Saturday delivery of live lobster is now available in most parts of the country. So even if you are sitting out there in Seattle or San Francisco, you can still be part of the lead up. Order the lobster online and have them delivered right to your house. Live Maine lobster can now be part of Super Bowl celebrations all across the country. Keep it simple with a traditional boiled lobster recipe. 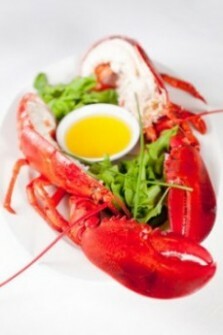 Boiled Maine lobster is easy to prepare, fun to serve and will be a big hit with the guests. This year Lobsters-Online is offering the New England eight-lobster special. When the lobster arrives on Saturday, you may keep them overnight by adding some wet newspapers and frozen gel packs to the carton. Don’t take them out of the carton to play with. It is important they stay cool and moist until ready to cook. If it’s below freezing outside, don’t leave the lobster in the box outside either. Eating the lobster begins by twisting off the claws and the tail and cracking the shell to get at the meat. Providing your guests with traditional lobster bib kits makes the job easy; the kits come with handy eating instructions.